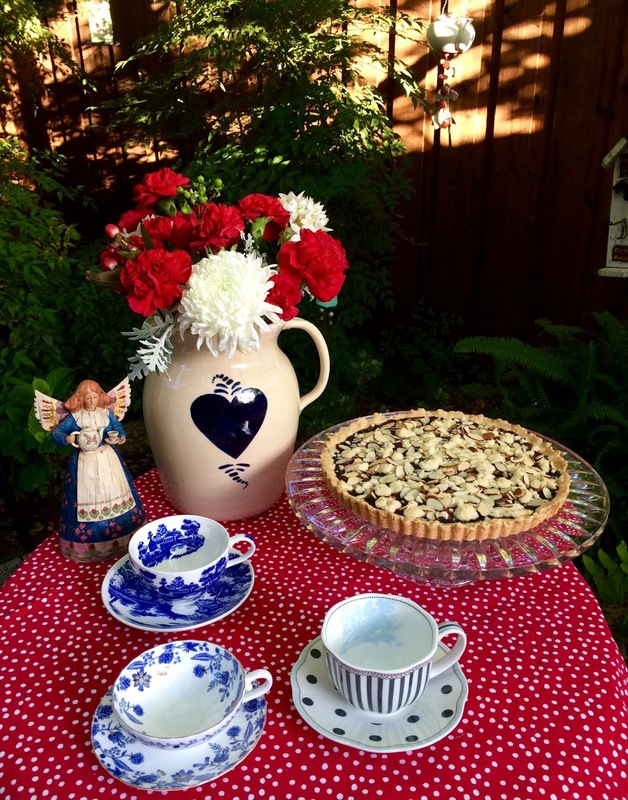 Would you care to join me for some Fergolotta with Almonds and Jam? I've had this recipe for some time, and finally decided to make it. You can choose one of my blue and white teacups for your tea. My friend, Joy, gave me the beautiful pottery pitcher when we first moved to Texas going on 32 years ago. Joy and I were friends in Ohio, and she and her hubby moved here six months before we did. Joy is one of those kind, gentle souls, that is always there for me. 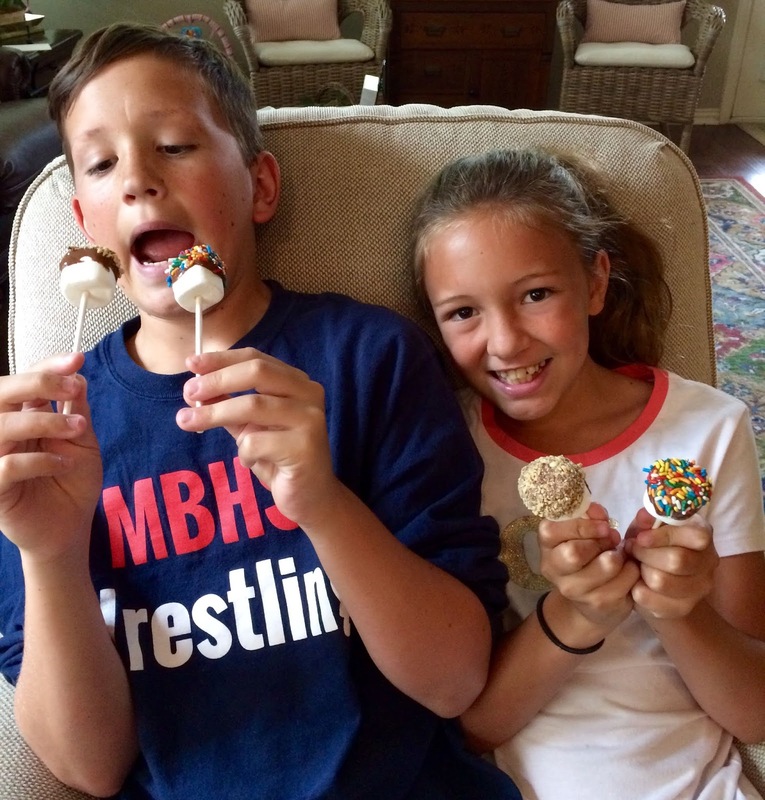 Cissy and her brother, Caiden, joined me for Cooking/Art Camp this week. After having lunch at Chik Fil A, we went and filled up a grocery bag to donate to a local Food Pantry. 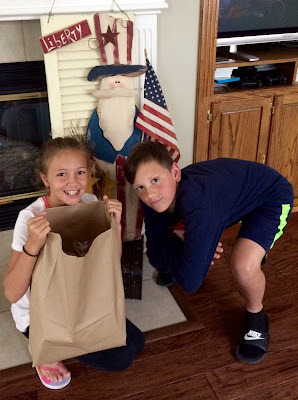 My church collects these bags once a month, and my helpers found things that were needed. Both of the kids asked if we were having Cooking Camp. I can't tell you what a JOY it is for me to know that they care so much!! We made S'Mores Pops and they had fun putting these together. I had seen this idea on the Today Show as a less calorie version of S'Mores. You just use a lollipop stick, dip the bottoms in melted chocolate, and then dip in crushed graham cracker. We also dipped some in sprinkles. These would make fun party favors, too! My son Mike, taught the kids and I how to make a watercolor sunset painting, and then we added a fine point sharpie palm tree at the end. Aren't they pretty? 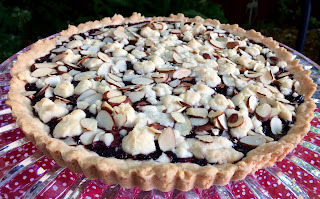 The actual name of this recipe is Fergolotta with Almonds and Jam, and I'm not sure what magazine I cut this recipe from. It says that the recipe is adapted from Millie's Bistro, in Toronto. I had some homemade blueberry preserves, but I think raspberry, peach, or apricot would be good, too. Beat together butter and sugar in a bowl with an electric mixer until pale and fluffy, about 4 minutes, then beat in extract and salt. Add flour and mix at low speed until just combined. Reserve 1/2 cup of dough, wrap in plastic wrap, and chill. Press remainder with floured fingers onto bottom and sides of 10" x 1" tart pan, with removable bottom. Chill shell until firm, about 30 minutes. Spread preserves over bottom of tart shell, then crumble the reserved dough over the preserves. Sprinkle with almonds. Bake in middle of oven until golden brown, about 40 minutes. Cool tart in pan on a rack, then remove side of pan. Serve warm or at room temperature. 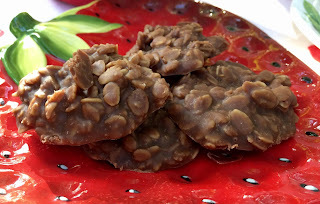 How about some no-bake cookies out by my waterfall? Cissy and I made some after school this past week. 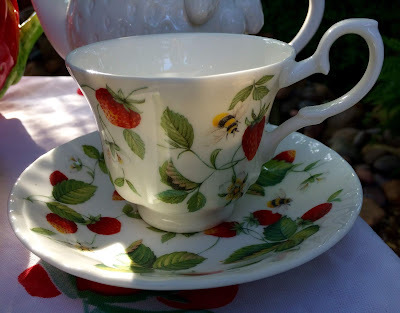 I'm using my Roy Kirkham Alpine Strawberry teacup. Can you see the bees that are in the design? 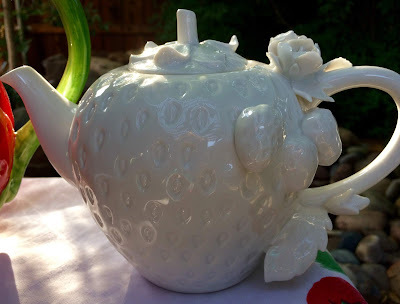 My Grace's teapot that my sister gave me is one that I love to use in the summertime. I'm very careful in caring for it because of the design. When I picked Cissy up from school, it was funny to see that we both had on shirts in the same shade, although her's is showing up more yellowish. Here is her plate of cookies to take home for her family. She showed me how to use the timer on my cell phone to take our picture! This past week, Riley, who is in the middle, graduated from 8th grade. Yes, he's taller than his 17 year-old brother! I was thankful to attend with the family. Also this week, Cissy, graduated from 5th grade. 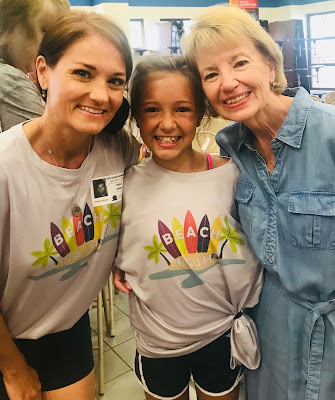 I'm here with my daughter, who helped with the after school Beach Bash for all the classmates. 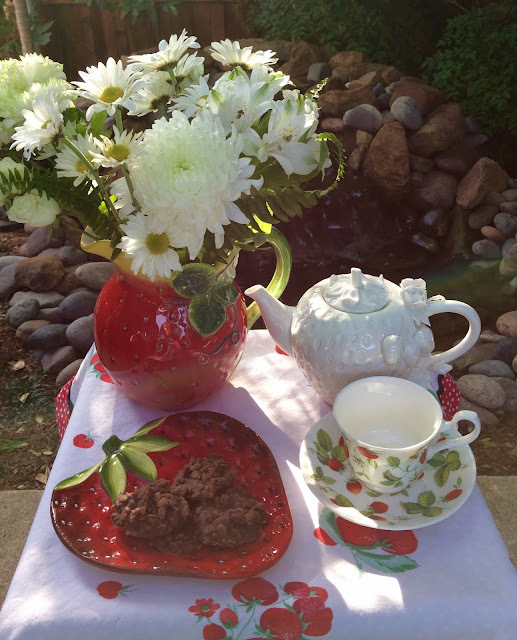 I used to make these for my own four kids when they were young, and now my grandchildren can enjoy them. Mix butter, milk, sugar, and cocoa; bring to a rolling boil and boil 1 minute. Remove from heat and immediately add peanut butter, oats, and vanilla. Stir mixture well and then drop by spoonful onto waxed, or parchment paper. Cookies will harden as they cool. 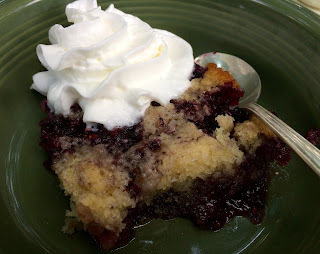 It's Blackberry Cobbler for teatime on the patio. Would you like to join me? I also have some Blackberry Sage tea, by Republic of Tea, which is one of my favorites. It says, "Tea for Wisdom" on the label, and I like it hot and iced. I used some of my doilies that I love for a table covering. 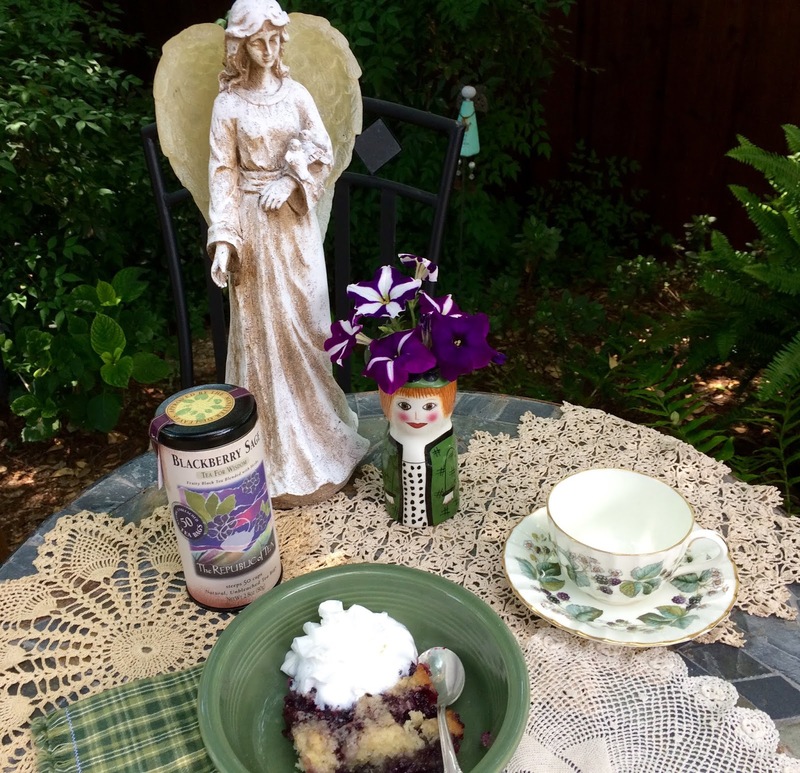 My long time friend, Pat, and I had lunch at a favorite tearoom recently, which is inside an antique mall. We decided to browse a few aisles before leaving, and we both spotted this blackberry teacup, and both thought at the same time, that we would buy one for each other! Isn't it pretty? 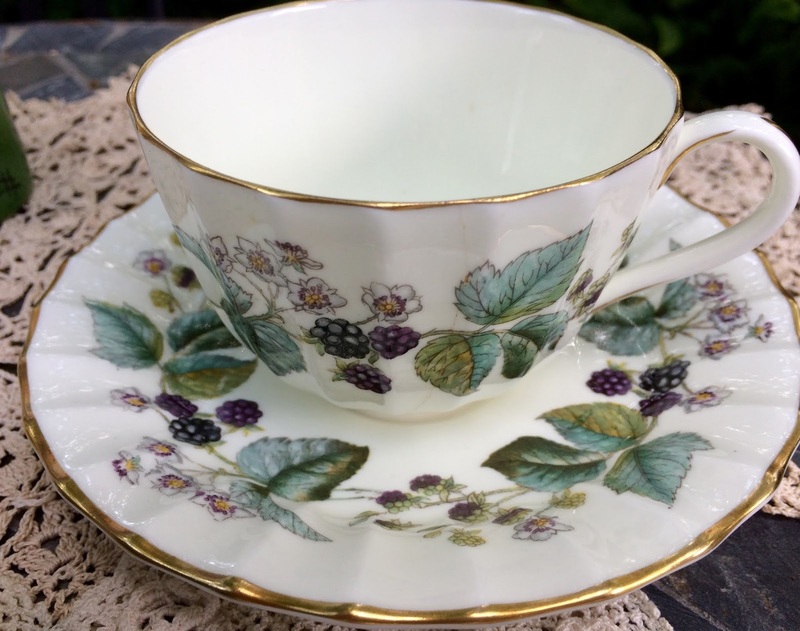 The pattern is Lavinia, by Royal Worcester. 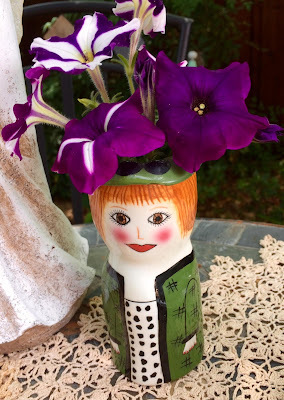 You know how I love my lady vase, and I filled her hat with some petunias! 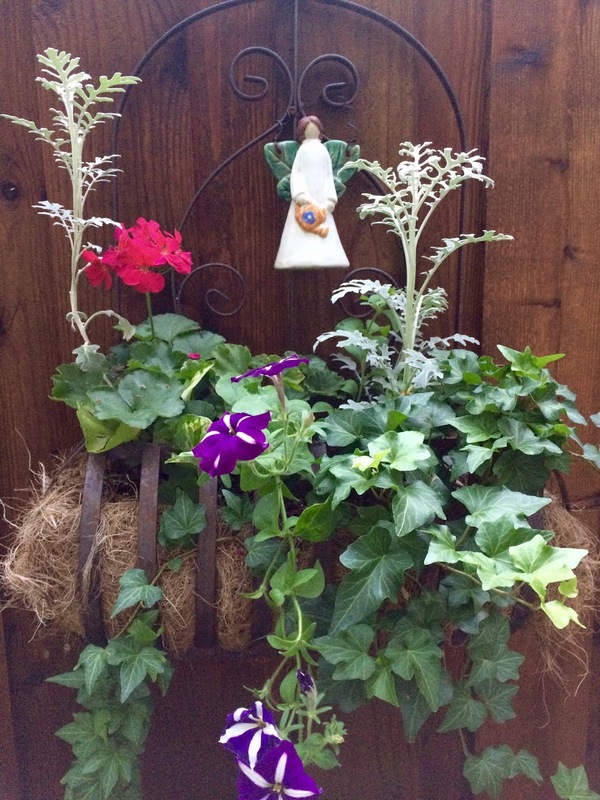 I thought I'd share one of my hanging planters that's overflowing with ivy, geraniums, dusty miller and petunias. 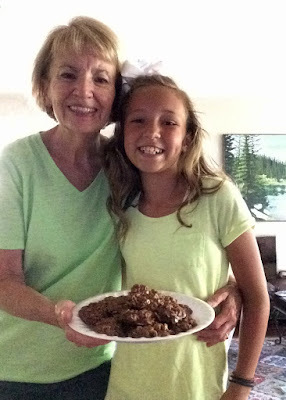 One day after school this past week, Cissy and I made pecan pies (her choice!!). Didn't she do a good job? 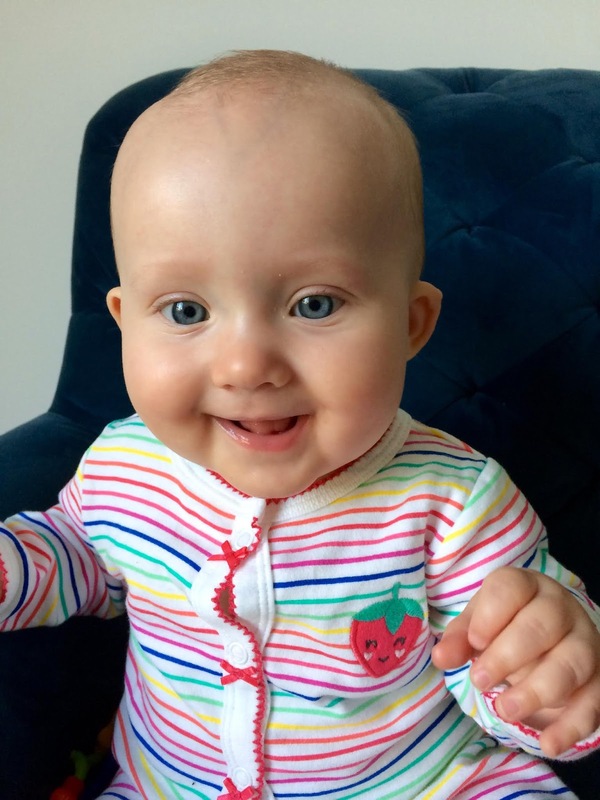 My son, Mike and I, were privileged to be asked to babysit for my two youngest granddaughters for three nights and days while my youngest son, and daughter-in-law went to San Francisco for a wedding. Harper and I made brownies together, played make believe, spent time in her donut shaped little pool, read books, and had such fun. 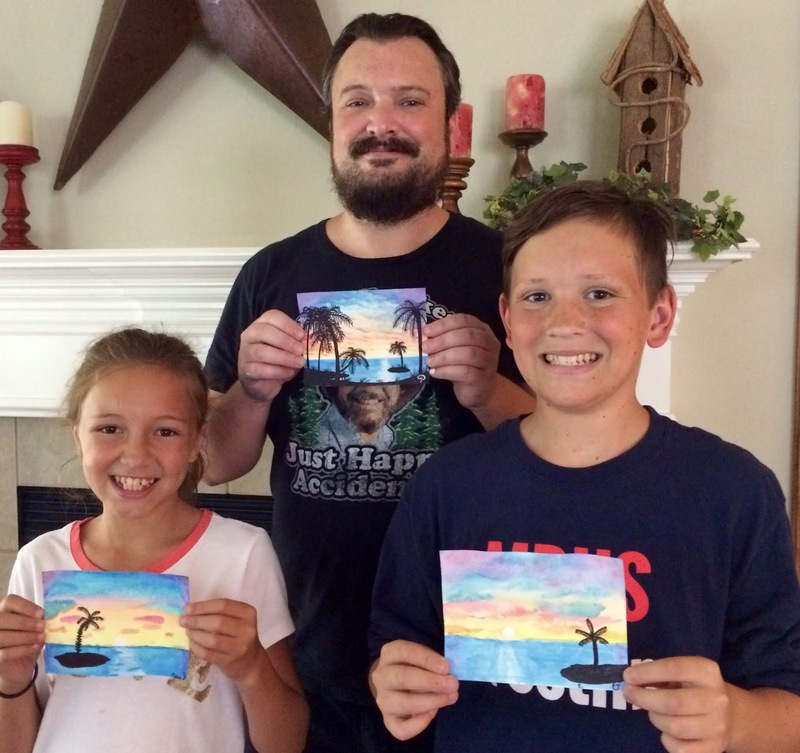 it was so nice that my son, Mike, came along, too, and helped with his nieces. They give him so much joy! Loving, caring for, and hugging this little cutie pie, Hayden, fills my soul with so much joy and laughter. She laughs so much around me, and it makes me so happy to know that my son and daughter-in-law tell me that they've never seen anything like it, except around me. One thing is certain, and that is, grandparents and grandchildren need to be around each other, as they have a special bond.